The Port Configuration step of the wizard is available if you have selected to configure installation settings manually. Catalog service port. The catalog service port is used by the Veeam Guest Catalog Service to replicate catalog data from backup servers to Veeam Backup Enterprise Manager. By default, port 9393 is used. 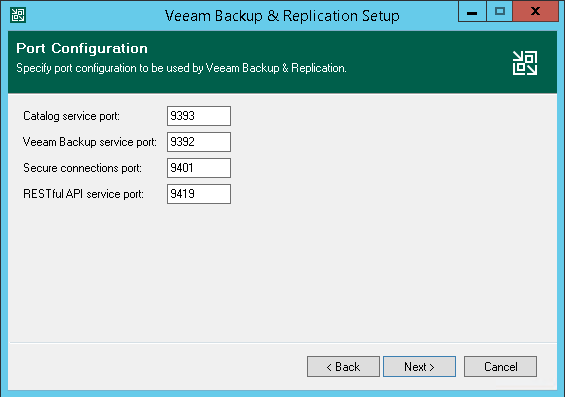 Veeam Backup Service port. The service port is used by Veeam Backup Enterprise Manager to collect data from backup servers. In addition to it, the Veeam Backup & Replication console uses this service port to connect to the backup server. By default, port 9392 is used. Secure connections port. The secure connections port is used by the mount server to communicate with the backup server. By default, port 9401 is used.